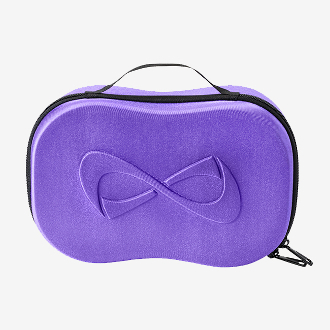 Mirrored after the Nfinity a shoe case, this hard exterior Makeup case protects while the interior zippered compartments organize your jewelry, makeup, and toiletries, and the eight-piece brush holder promises to protect the integrity of your set. Great for cheerleaders, dancers & skaters! Fits handily in weekender front slot. Warranty covers defects in materials and craftsmanship for up to 90 days.